By default, Amarok uses SQLite to maintain the library and other data such as ratings, play-counts etc. 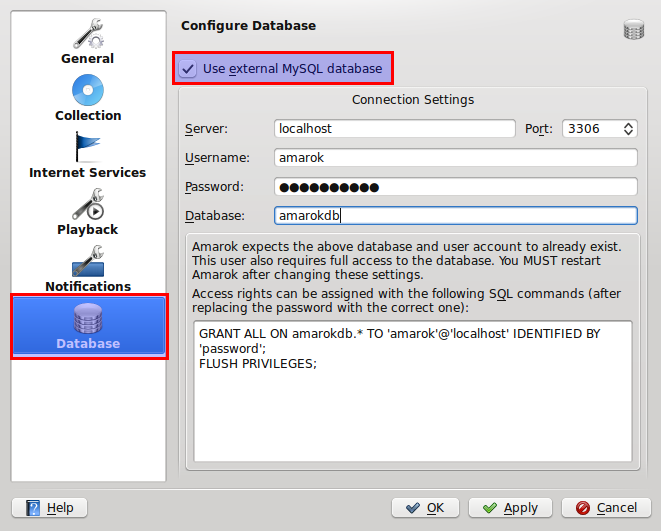 However, Amarok also comes with support for MySQL databases, although it is not enabled by default. With larger library (like mine which is around 50GB) I find that using MySQLis faster than when using SQLite. So, here is how you use MySQL in Amarok instead of the default SQLite. Make sure you remember the password you set during the installation.It will be the root password for your MySQL installation. Now that you have installed MySQL, you need to create a new user and a new database for Amarok to use. Enter the root password you created at the time of installation and you are connected. Then create a new database for Amarok to use. Let us call this "amarokdb". After creating the database, we need to make sure that user "amarok" has all previleges in the database. and then close the Terminal. The part about the database is over now and Amarok needs to be configured to use the database we just set up. This is much simpler that the above steps. Now Amarok will rescan your library and this time it will use the MySQL database.